Last week was the cleaning and organizing of my craft room. Yes, I did get finished except for our trip to IKEA to get that desk I want. That will be the finishing touch. This week is the office. We haven't cleaned or organized the office in a long time and there are piles upon piles of paperwork that needs to be filed and just junk mail that gets thrown in here when we need to clean off the dining room table when we have company. I guess you could say most of it is either trash, goodwill, or filing. We do have some items that are in the office that we will save and put out on ebay vs. goodwill. I have two desks to clean off as well as a credenza, so I started on the largest desk this morning. I was able to get a few things sorted and shredded before we started running errands. I really need more organization in the office. In the big desk I have one drawer that is just full of cards. There are birthday, Christmas, get well, thank you and a variety of other cards just waiting to be sent. Problem is, I don't send cards very often and here they are taking up a whole drawer. What to do? Oh, I have another drawer that is full of cards that we received that I just had to save. Now why did I save them? Okay right, I was going to use them in some craft project or other. There has to be a place to donate old cards right? I'll have to look that up on the internet. If you know of a place, let me know in the comments as I would like to take back that drawer. 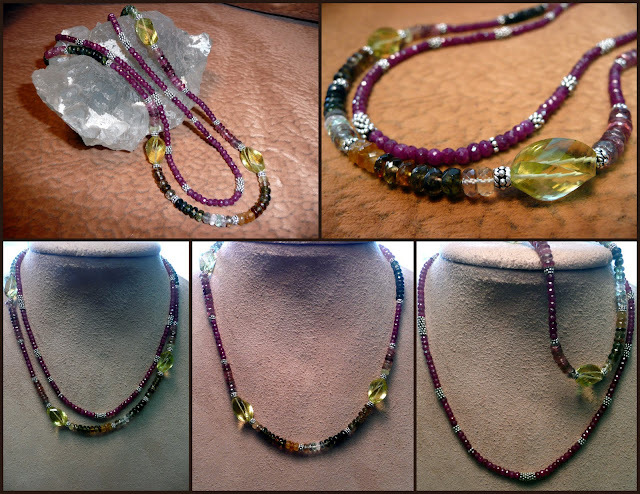 Now I thought I would share photos of a necklace set that I made right before the holidays made with rubies, multi color tourmalines, lemon topaz and sterling silver. I love the cut of that lemon topaz, it's sort of a spiral cut. I haven't listed them yet for sale, but they are pretty. Enjoy and have a great day! Wow - that necklace is absolutely stunning!